This 16 x 48 inch canvas print, is wrapped onto a solid American made wooden frame is a piece of art. This is an historical photo of the worst storm to ever hit New Jersey. Ready to hang on your wall, own a piece of history. This 16 x 48 inch canvas print by Bill McKim is wrapped onto a solid American made wooden frame is a piece of art and also a historical photo of the worst storm to ever hit New Jersey. 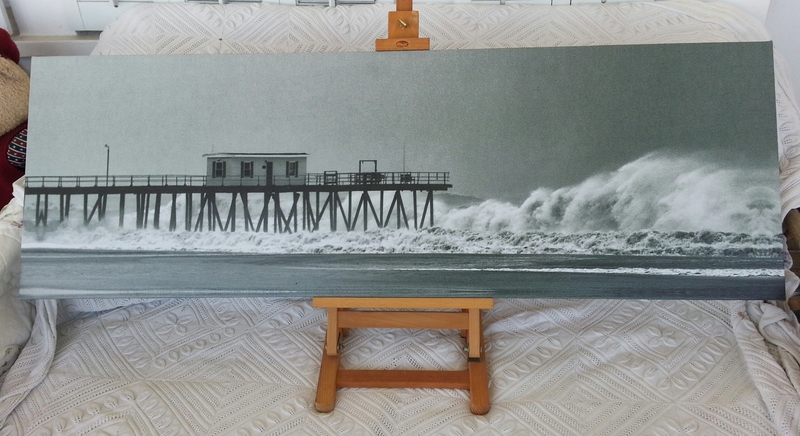 The Belmar Fishing Pier was heavily damage and the house on the pier was destroyed from waves crashing thru the bottom of the pier up into the house.This canvas print print is ready to hang on your wall and does not require an additional frame. This is an historic print of Hurricane Sandy. Signed and dated Limited Edition print. Portion of the proceeds from the sale of this print go towards rebuilding the Belmar Fishing Club Bait House. I made the image standing in 60 mph winds using the 3rd ave bathroom trailer on the Belmar boardwalk to block the wind and completed the image before my lens was soaked from the rains and ocean spray. After taking these photographs I went back to my home– grabbed the few items seeing how bad the storm had gotten— locked my front door— said a prayer hoping to see my home built in 1875 again. I returned early the next morning . My home was battered– the boardwalk had gone through my home’s porch windows and left 7 feet of ocean water in my basement. I knew I was lucky compared to other folks. The Belmar Fishing Club bait house on the pier was ruined from the force of the waves breaking through the floor of the house and causing extensive damage to the building. The BFC decided to replace the iconic building on the pier with a new baithouse for the fishermen.